As sendoffs go, the Koenigsegg One of 1 is rather special. Koenigseggs are typically made in limited production numbers. Its most recent hypercar, the Regera, is limited to just 80 units, and they’ve all sold out. This model, however, is one of the rarest. 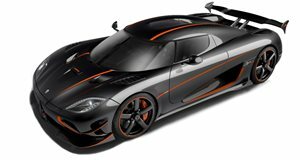 Not to be confused with the insane One:1 hypercar, the ultra-limited Koenigsegg One of 1 was built as a swansong for the Agera RS. First shown at the 2016 Geneva Motor Show, only three were made to mark the end of the Agera’s production run, each in a unique color - one of which is looking for a new owner. It’s mechanically identical to the One:1, but received several flourishes and one-off parts to make it even more special. 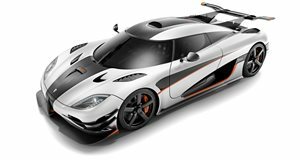 The Koenigsegg One of 1 features a custom top-mounted rear wing with a second blade, a unique roof-mounted air intake and a custom front splitter and side skirts, as well as a Koenigsegg Shield mesh at the rear. There’s also a 3D printed twin-exit titanium exhaust outlet with the ‘One of 1' name imprinted, and the limited-edition supercar is brandished with special badging on the wing, side and interior. The exterior features custom designed paint with partial clear carbon, and the interior switchgear is polished in aluminium. Performance is identical to the One:1 with the 1 MW engine upgrade installed, meaning you get a twin-turbocharged 5.0-liter V8 that produces 1,360-hp and 1,011 lb-ft of torque, allowing the hypercar to reach 186 mph in just 17.95 seconds. Now, the Koenigsegg One of 1 that was presented at the 2016 Geneva Motor Show is being sold at a German dealership. Finished in a striking orange and black exterior with a black leather interior, the hypercar has only covered around 50 miles. Semco Cars is asking for 6,545,000 Euros (around $7.7 million) which may sound like a lot, but keep in mind that the Koenigsegg One of 1 will never be duplicated.